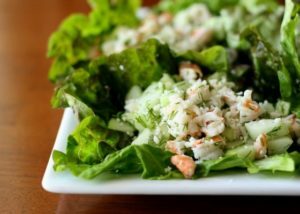 The Shrimp and Cucumber Lettuce Wraps with Fresh Dill is a tasty recipe for the whole family to enjoy! Did you know that lettuce wraps are a great alternative to traditional sandwiches. They are low in carbohydrates and can be a simple way to include veggies in your meal! The Shrimp and Cucumber Lettuce Wraps with Fresh Dill is acceptable throughout all phases of Ideal Protein. Place broth in a skillet and heat to medium-high heat. Add garlic. Cook for approximately 60 seconds and then add shrimp. Cook until shrimp are pink and opaque, about 3-5 minutes. Remove shrimp from pan and set aside to cool. Add vinegar to skillet, and let sauce reduce to about a third. When shrimp are cool enough to handle, remove all the tails and chop coarsely. Combine chopped shrimp in a medium bowl with reduced pan juices/ garlic, diced cucumber, dill, lemon juice and a few pinches of salt and pepper. Spoon filling into lettuce leaves, roll and serve. And now you have a Shrimp and Cucumber Lettuce Wrap with Fresh Dill. That’s a Wrap! For more information on Ideal Protein, please attend a FREE informational seminar every Tuesday evening at Baudry Therapy Center at 5:30 PM and find out how you can lose weight safely and effectively. Simply call 841-0150 to reserve your spot. You can also visit BRIO.